Did you find your shoes filled with treats yesterday? December 6th marked St. Nicholas Day. While many of us leave stockings out on Christmas Eve, the origins of Santa Claus can be traced back to the real Saint Nicholas, a bishop that lived from 270 to 343 A.D. in what is now Turkey. Bishop Nicholas helped the poor through giving generous gifts and was a miracle worker. Later on, around 1820, the legend of Santa Claus started to become popular. 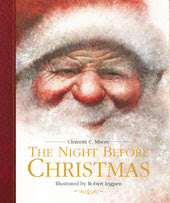 Clement C. Moore's poem, "The Night Before Christmas" helped popularize this familiar figure and the gift giving on Christmas Eve. Time Magazine published an informative two-minute bio of Santa Claus, if you're interested in reading more about St. Nick and Santa. Also, the VeggieTales movie, Saint Nicholas: A Story of Joyful Giving, is a great way to introduce children to the story of the real Saint Nicholas. While we don't own a book about the real St. Nicholas, we do own several copies of The Night Before Christmas. Thanks to Sterling Children's Books, we had the chance to read a newly illustrated version of Clement C. Moore's beloved poem. For those that celebrate Christmas, owning a copy of The Night Before Christmas is almost a requirement. On Christmas Eve, many people read the poem, in addition to the Biblical story of Jesus' birth. Robert Ingpen's gorgeously illustrated picture book is an excellent interpretation of this familiar poem and makes a wonderful addition to any Christmas book collection. The incredible paintings in this version balance the fantasy of the story with realism. Ingpen creates a warm, idealized Christmas with highly textured illustrations full of feathery brush strokes and depth. A traditional, classic Santa Claus with a wrinkled, weathered face, full beard, rosy cheeks and fabulous red suit takes center stage in the book. He visits a simple manor house adorned with a tower and several chimneys, a house that could have very well existed at the time the poem was first written. Ingpen's interpretation does not include whimsical touches, like showing sugarplums dancing, but instead the images display the magic of the night in a subdued way. The book works well as a read-aloud, and is set with an easy-to-read, large font, perfect for low-light environments on Christmas Eve. A short biography of Clement Clarke Moore in the beginning of the book explains the origins of his poem, a story originally intended as a Christmas present for his children. I especially love the well-crafted design and detail displayed in this book. Underneath the dustcover is a bright-red, fabric cover with a simple, classic inset. The endpapers show a starry sky and if you look closely, it almost looks like St. Nick has magically disappeared into the night. Robert Ingpen has also illustrated several other classics including The Christmas Carol. He's an accomplished Australian author and illustrator and has won several awards for his works. It's not too late to start counting down to Christmas. 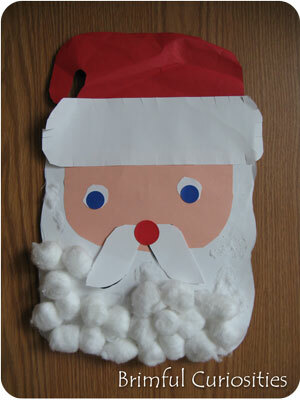 My daughter made an adorable Santa Claus out of construction paper. His cotton beard marks the days until Christmas arrives. She started by gluing on 24 cotton balls onto her red-nosed Santa and each day she removes a cotton ball from Santa's beard. I've seen other versions of this craft, but they all usually involve gluing on a cotton ball to mark the days instead of taking one off. I like the idea of removing rather than adding because you don't have to keep a supply of cotton balls and glue handy to use every day. Sterling Children's Books has graciously offered to giveaway a copy of this lovely, classically styled version of The Night Before Christmas to a Brimful Curiosities reader. • Contest ends on Wednesday, Dec. 15th, 2010 at 11:59 PM CST. What a beautiful version of an old favorite. This may replace Mary Engelbreit's version as my favorite. Love the Santa countdown Idea. I tweeted about the giveaway & follow you on Twitter. I saw a cotton ball santa advent calendar that had a number strip through his hat. This would be a great addition to our holiday book collection! I follow you on twitter - @happylhomemaker. We are just starting our holiday book collection - this would be a great way to begin! Thanks so much for linking to my post!! I love your blog and can't wait to read more!! The illustrations look like they'll be beautiful! That's a cool idea to take off the cotton balls instead of putting them on every day! Santa Advent Calendar looks great! The Night Before Christmas is always a must read for us at Christmas time. I can't believe I don't own this title. Please enter -e. The letter after L is broken on the keyboard....grrr...Joyeux Noel! I love those adorable things the kinds make and bring home from school this time of year. I'd like to win this book for my kids. The calendar is a neat idea. Thanks. Would love to win this book. Then we could do our Christmas puzzle and read this book. The book sounds wonderful! And I love the Santa beard countdown. We're counting down using an activity for every day and envelopes we remove from the wall. My son loves it! What a cute idea for a craft project. I've seen count down calendars where you get to have a piece of candy or a small cookie each day until Christmas. This book would be a welcome addition to my collection. The cotton ball Santa idea is cute. My family used to read this on Christmas Eve when I was younger. I don't have a copy of any version, though. I'd love to continue the tradition with my own kids. I would love to share the book and count-down calendar with my preschool classroom! I love the vintage feel to this book - it would be so much fun to read to the kids! My little boy is excited about Christmas for the first time - just loving it! My girlfriend would love this book! I would love to win a copy of this version of The Night Before Christmas. What a beautiful book! I know the childen at my eleemntary school would love this as a read-aloud! Would love to finally own a copy of this book! What a great story this is and how wonderful it would be to own! I follow you on Twitter & tweeted with a RT to you! This sounds like a beautiful book illustrating the classic The Night Before Christmas story. I would love to win this for my grandchildren. I follow you on Twitter (@cspring31971) and I tweeted. I used to have a copy of this story that was textured with felt on the book! looks like a beautiful book and illustrations! This sounds like something my kids would enjoy.